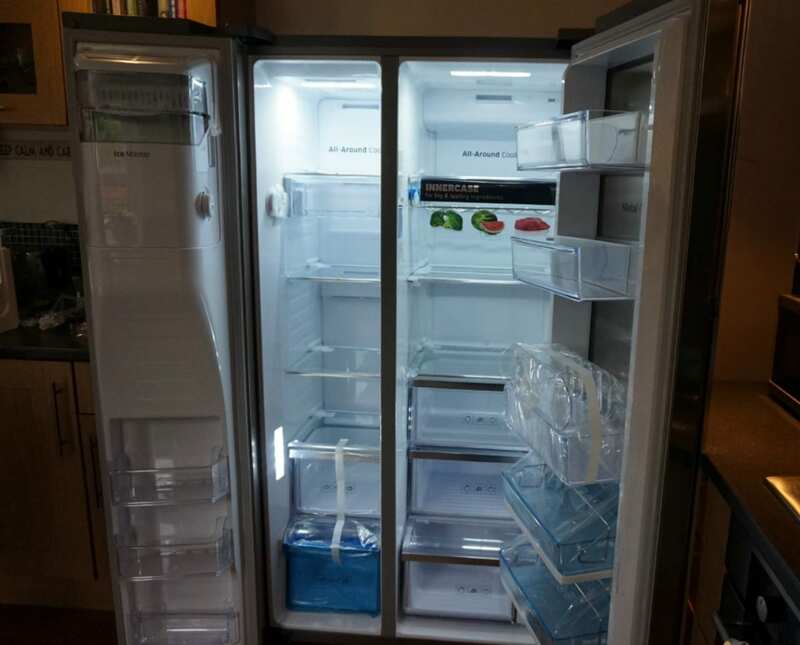 I am thrilled to be reviewing the stunning, brand new Samsung Food Showcase American Fridge Freezer at the moment, so wanted to give you my first impressions, before I go through the detailed review in a few weeks’ time. 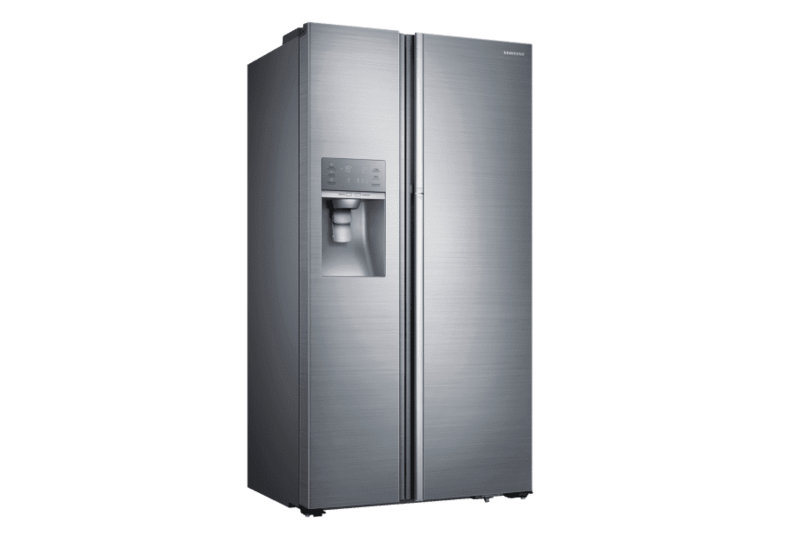 This brand new product from Samsung combines innovative design and stylish good looks to bring you the ultimate in fridge freezers, and we are so excited to be putting it through its paces and reporting back to you. Once we’ve spent some time using all of the features, I’ll be back with much more detail, but for now I want to show you what it looks like, how we got it into the house, and what we think so far. 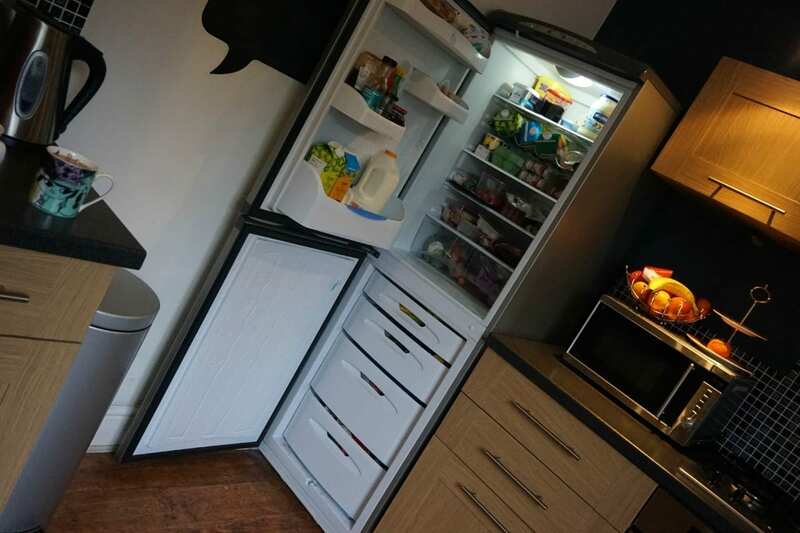 The Samsung Food Showcase is designed to allow the consumer access to their favourite and most frequently used items easily in the ‘inner’ fridge door. On opening the outer door, you’re faced with a further door housing multiple baskets that can be accessed from the outside. Not having to open the main door means less energy wasted, and fresher fruit and vegetables. 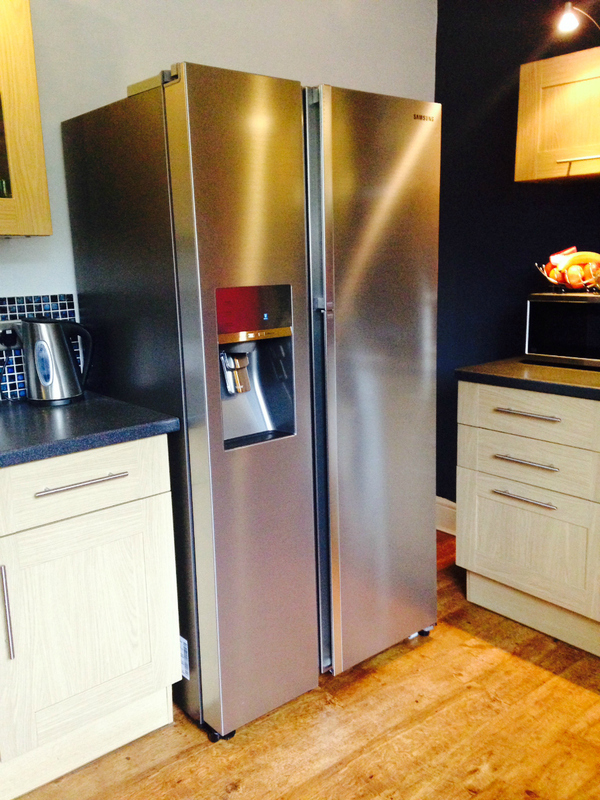 As well as this innovative design, the fridge freezer has all of the usual features such as, wine rack, egg basket, separate freezer and ice maker. It’s important to note this is a very large item, and ideal for the family. It is also beautiful to look at, fitting seemlessly into a modern home. So what did we think when it arrived? I have to say I was thrilled when the logistics company called to arrange deliver of the item. 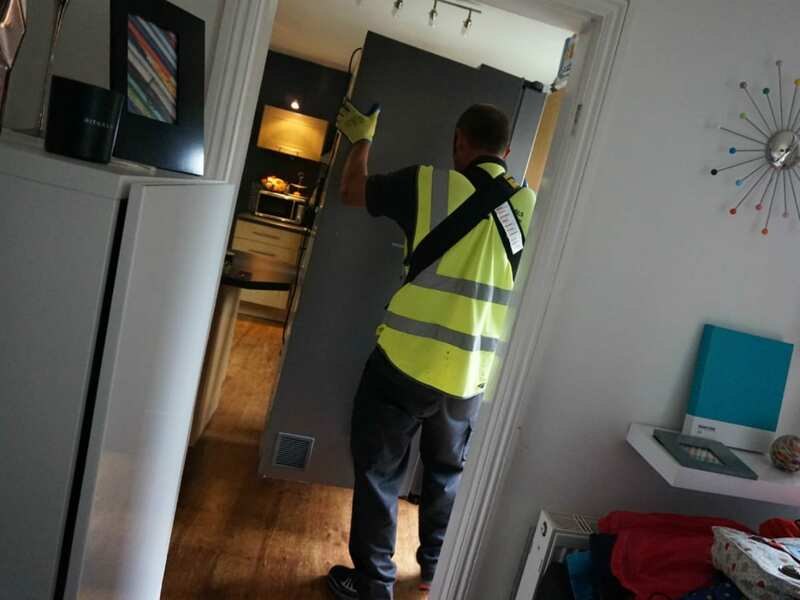 As these types of Fridge Freezers are so large, they routinely conduct an Access Survey over the phone, checking the measurements of the gates and doors on the entry path to your home. Dimensions of the Food Showcase in the packaging immediately told us we wouldn’t be able to get into the property, but it is standard that the items are unpacked before entry, and even removal of the fridge doors can be done if necessary. The delivery company were fantastic, and put my mind at rest, agreeing that once we had removed the gate and back door we would manage to get the Showcase into the kitchen. 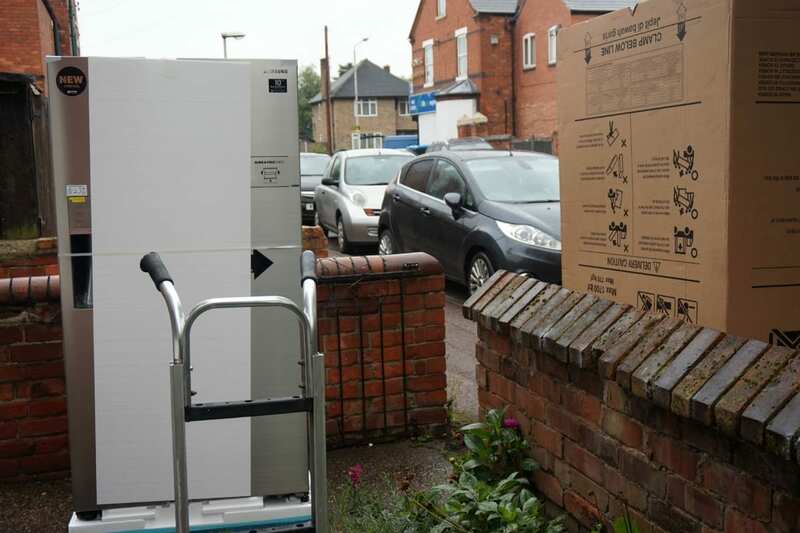 When the delivery team arrived, they couldn’t have been friendlier or more helpful, as they cleverly lifted the Showcase into place, and took our older, much smaller fridge freezer away too. We knew from our research that it was going to be a tight squeeze but we have plans to revamp the kitchen slightly to allow better access to cupboards now the Showcase is in place. 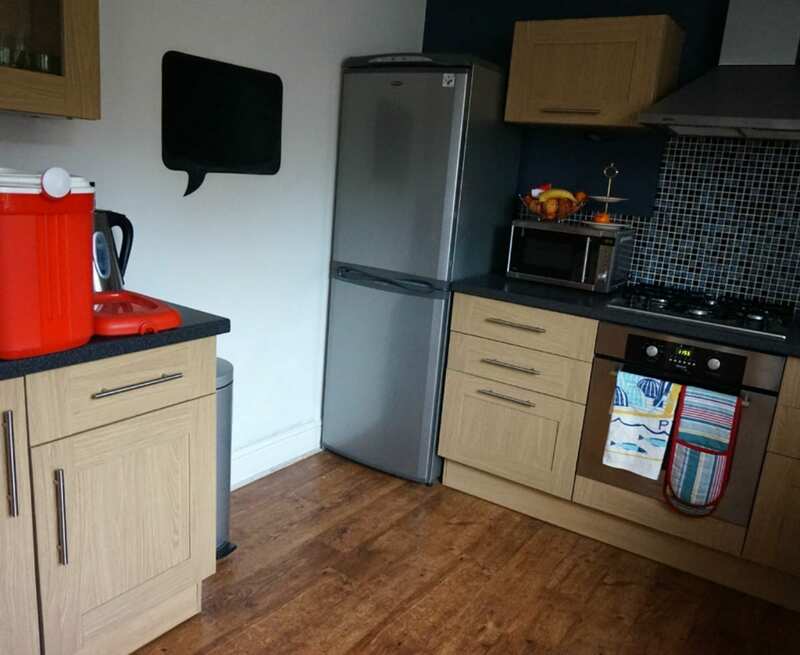 Having removed the old fridge freezer we can add some new cupboards and worktops, and connect the Showcase to the water supply. The delivery team would have connected the Showcase to the water feed, if we had had it in place. We spent a little time unpacking and organising, and then waited for it to get to the correct temperature. On first impressions, I am thrilled with way it looks. I love the simple, clean design and the stainless steel contemporary finish. It suits our kitchen well, and even though it’s large, it doesn’t feel overwhelming. We have a relatively spacious kitchen, but it’s certainly not huge and the Showcase fits in well. It came to temperature pretty quickly and took our current food really easily. In fact, it looked pretty bare! I love how easily you can see where everything is, and I’m hoping this will help us waste less. We’ve started looking at the instructions for water connection and will get that done in the next week. In the meantime, I’m off to the shops to buy some more food, and wine of course! If you want to find out more about the Samsung Food Showcase, you can see it in full here on the Samsung website. As I said, I’ll be posting a full review here on the blog very soon, so do pop back for more information. It is lovely isn’t it. I went to the launch. I love the drawer just to put the ice in so there’s room to make a whole lot more ice. Yes it takes some filling – so plenty of room for bottles of wine. The more we use it Joy, the more we love it! So many features. I bet. I am very jealous. Michelle, I’m bowled over by the space, and how easily you can see everything. I am so jealous as I would love one of those. Our friends have one and it is such a brilliant piece of equipment to have when you have a family as it stores so much food. It sounds like the whole delivery service was amazing too. I am looking forward to the review. Thanks Nikki, didn’t mean to make anyone jealous! I really was impressed with delivery! I’m too jealous to read or see any more. I want an ice maker damn it! I would seriously love a fridge/freezer like that. 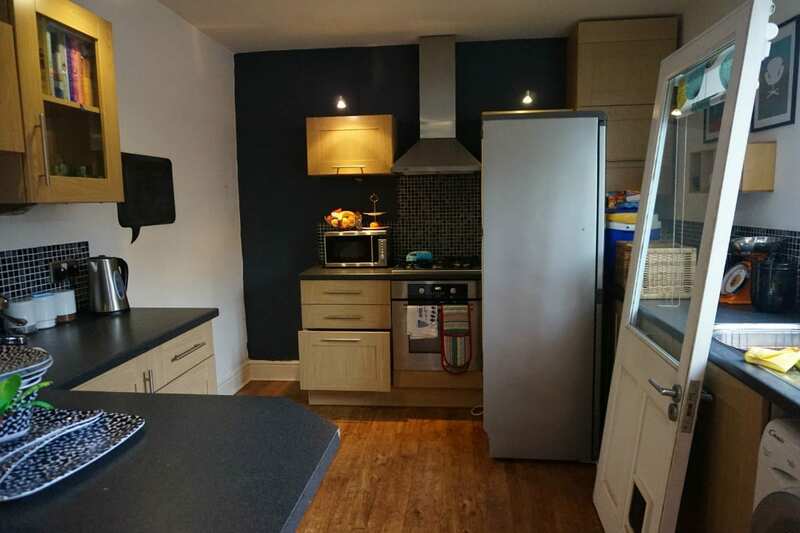 Truth is that we’d probably have to build a whole new, bigger kitchen though to fit it in! Well that was almost the case here Penny! Thanks Cass. We’re having fun testing out all the features. I can’t wait to see it filled! I also would be really interested to hear more about the compartments, and how you divide the foods, and the capacity. Our F/F looks huge, but doesn’t actually hold very much at all, but luckily we have another one in our garage. This looks like it would hold a big shop, but still allow the air to move around, something we definitely have trouble with! Oh I’d love a huge fridge/freezer like this alas we live in a tiny terrace so no room. I just love the idea of having space for everything and being able to see what is on each shelf.